Your visitors expect you to make it easy for them to get in touch. 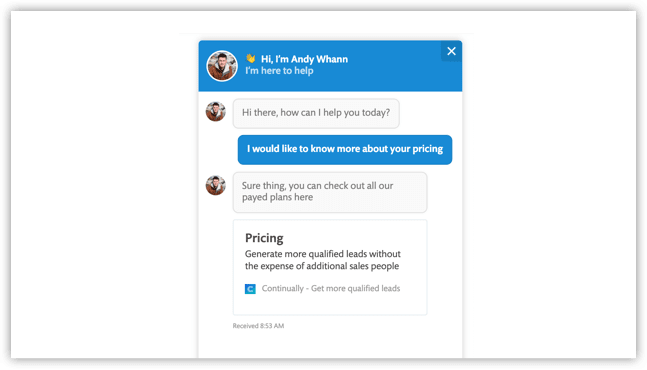 Forms are unfriendly and impersonal, so there’s a big shift towards using live chat and chatbots on your website. If you’re just getting started with messaging, it can be hard to know whether you’re creating the right experience for your visitors. Here are seven tips and tricks to help you see better results. Asking new visitors “👋 How can I help today?” is one of the simplest things that you can do to welcome customers and make your business more approachable. We all respond to other people. If someone lands on your site, a helpful welcome message is a great way to say hello. Even though you’re using automation, it makes the experience more human, accessible and available. It works because you’re letting people know that if they have a question, you’re there to help. As a potential customer, if you need information, you know where to go and get it. It puts the buyer in charge of the decision and lets them engage with you when they’re ready. If you can make it more targeted to your potential customers, that’s even better. 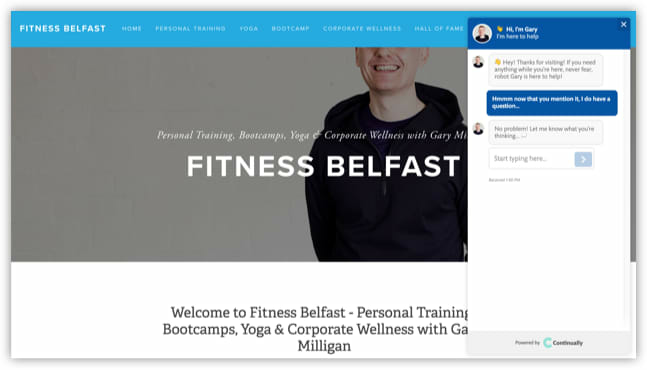 Across all the websites we see on our platform, this is consistently one of the the differences we see where people are getting better results. It will only take a couple of minutes to set up. If you haven’t already, try setting a welcome message. 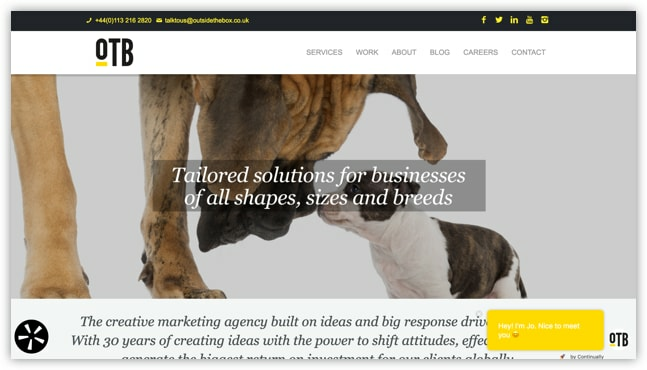 Creative marketing Agency, Outside the Box, use a standout welcome message to greet new visitors. It’s distinctive, well branded and written with a friendly tone. We naturally use empathy and build rapport when we meet people face-to-face. With messaging on your website, we can’t use body language like gestures or facial expressions. But you can still use empathy to create a more personal experience by focusing on what’s important to your customer. What’s their context when they’re visiting your website? If you focus on their problems and feelings, they are much more likely to engage. For example, if they are there to make a buying decision, help them find the information they need. Understanding their goals, motivations and emotional state will help you respond in a way that matches their expectations. What questions might they have? What are they trying to accomplish? What outcomes are they here for? When you look at your customer’s goals from their perspective, it’s much easier to write questions, messages, guides and content that helps them move forward in the buying decision because it’s written for them. Whether you’re someone buying your first home or re-mortgaging, the experience of finding a mortgage can be pretty stressful. 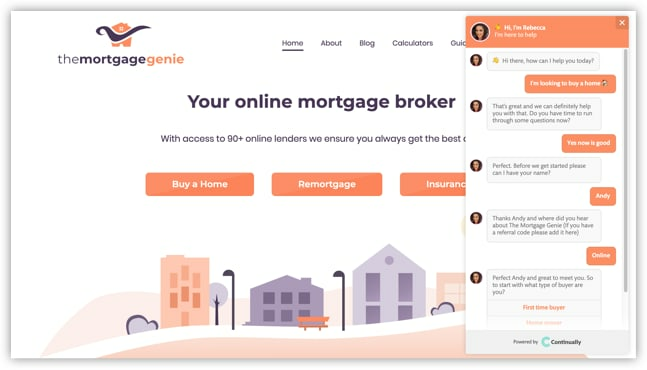 Mortgage broker, The Mortgage Genie,, use a friendly, helpful bot flow that puts visitors at ease. Tip:Reply with your visitor’s name when they introduce themselves. How can you help visitors move forward? In today’s world, we’re all connected. It’s easier to find information and buy from anywhere. Customers are firmly in the driving seat when it comes to making a buying decision. Today, on the web, the customer is king. They buy solutions and outcomes, not products, and judge firms on whether you are able to meet their needs in a way they find satisfying. In other words, it is their perceptions and experiences that matter. Despite this, many websites fail to help customers get the information they need. Personally, I find it frustrating when I’m visiting a website and can’t find what I’m looking for. According to research carried out by digital marketers MyCleverAgency, I’m not alone. 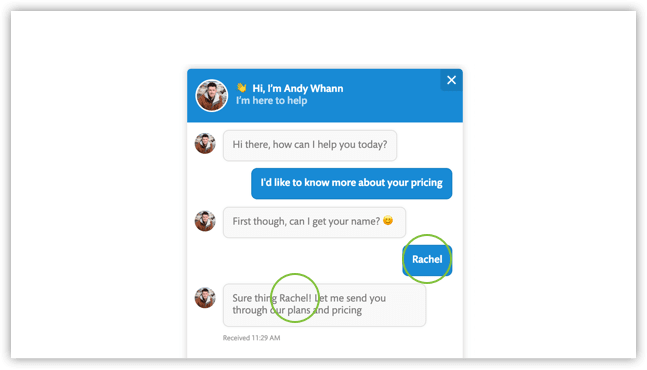 Using a bot is the perfect way to give visitors quick answers to questions. Even better, it works 24/7. With traffic coming in from all over the world, your office hours won’t always match up with the times your customers need help. So when you’re not there – say out of office, at nights, or at home over the weekend – a bot can keep talking to your visitors. Using multiple choice questions can help visitors quickly get to the right place. And when they do engage, their answers will give you valuable insight into their needs and motivations. Picking from pre-defined choices is easier for your visitors, because it takes less time and effort than writing an email or making a phone call. The answers to those questions don’t have to be just text. You can link to helpful content you’ve already produced (you might think, “gosh, we have a whole page about that.”). Or you can add resources like images or YouTube videos and answer the question there and then. Bots will scale as your business does. Big seasonal rush? No problem. Automation will mean that you can answer those questions without needing extra help. The business impact of helping visitors is that it will increase the flow through your funnel. By helping visitors get the information you need, you avoid frustration. Even better, you help them understand how their life will be better in the future. And by doing that, they will be motivated to take the next step in their buying journey. 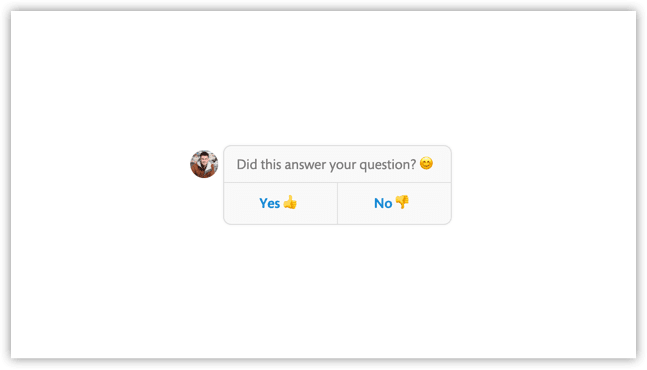 Tip: Use multiple choice questions to route customers into different paths. 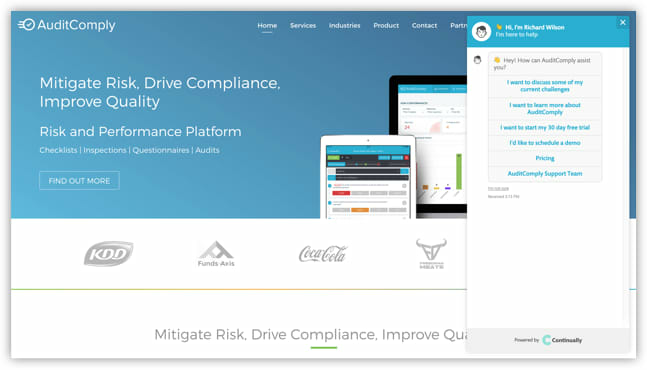 Enterprise software developers, Audit Comply, have structured their welcome message around the types of questions and information that new visitors typically look for. Each choice takes the visitor on a different path that helps them get to the right outcome. This is one of my favourite tips as I’m often guilty of this myself. Imagine you’re speaking to your visitor in real life. How would you talk? I think you’d use less formal language. Like “Hey”, or “Thanks” instead of “thank you”. The the way that people communicate today has become much less formal with the rise of messaging. Think about when you get a message from someone on your phone: the tone is more like they’re speaking to you in person. So I think there’s a lag in the way that we react with business communication. More conventional writing - like email - can still be very formal. When using tools like messaging it’s easy to continue that formal tone you might use in a letter or an email. It’s probably not what your customers are expecting. It might happen, but there’s more to be gained than lost. People will give you feedback if you’ve overstepped the line. As long as it sounds like you and as long as you are expressing yourself in a way you feel comfortable with, you have a lot to gain by being more authentic. Fitness trainer Gary Milligan strikes a wonderfully authentic tone. I’ve never met Gary, but I imagine that a big part of working with a personal trainer is about how you work together. His use of a wrestling gif adds a delightful touch and sense of fun. Every customer is different. Speak to them like individuals. It’s easy to fall into a broadcast mode of communication. Instead of speaking to one particular customer group, your messages treat every customer the same. But customers aren’t all the same. Every market is different and most businesses have a lot of diversity in their customer base. You might have different products for different customers. People at different stages in their buying journey need different information and help to buy. One type of experience and one type of buying journey won’t satisfy all those different audience needs. 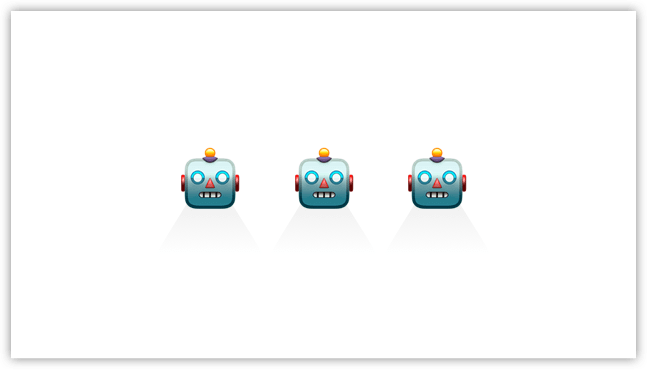 A great way to tackle that is by using multiple bots that take visitors on different conversational flows. We already covered the idea of a general welcome message for people who are interested in buying. What other types of questions might your customers have? What other types of buyers might we have? What other types of decisions might they want to make? If you reach your audience through organic channels, like social, inbound links or search, then you’ve likely got some really interesting and relevant content already working. Those users may be coming across your site for the first time, interested in the particular topic you’ve written about. Blog pages can be great for building a top of funnel audience, but it’s common to see high bounce rates and low engagement. Try adding a bot with a welcome message that expands on the article’s topic. You can make it much easier for that visitor to learn more about your business, how you can help them and what they should do next. That might mean using the bot to convert top of funnel visitors to subscribers by adding them to your mailing list (using a service like Drip, Mailchimp or Aweber). Or you might have another resource that helps determine where the customer is or move further along in their buying decision. 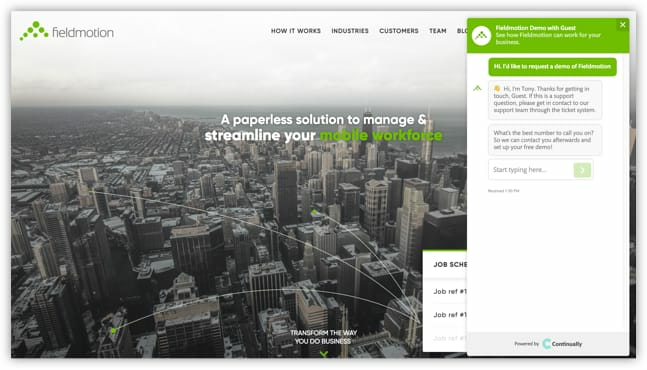 When customers are thinking about buying, pricing pages are a great example of someone moving towards the bottom-of-the-funnel. Their behaviour shows that these visitors have high intent. This means that the effort involved in creating and running a bot has a great ROI because they’re closest to buying. At this point, they likely have very specific questions or objections that are holding them back from making the purchase. A bot can help tackle these and make sure your visitor doesn’t bounce without trace. 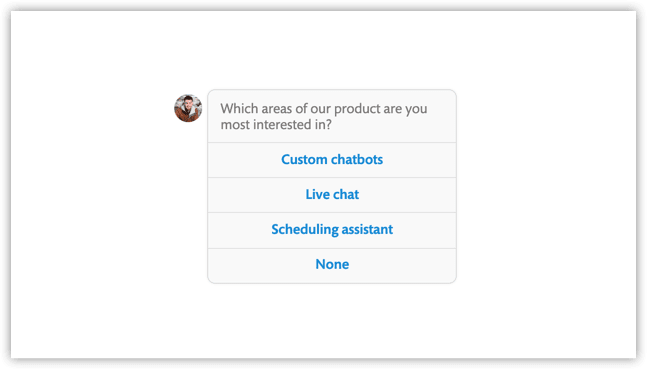 Using a bot can also help you better understand those visitors, and with a couple of qualifying questions route qualified leads to your sales team for follow-up. Adding a bot to your landing page and target the conversation based on what you know about that user. For example, you might be reaching buyers from early in their decision process with organic traffic, as well as customers ready to buy right now through paid ads. You can target bots to respond to each traffic source by using UTM variables you may have in the URL. 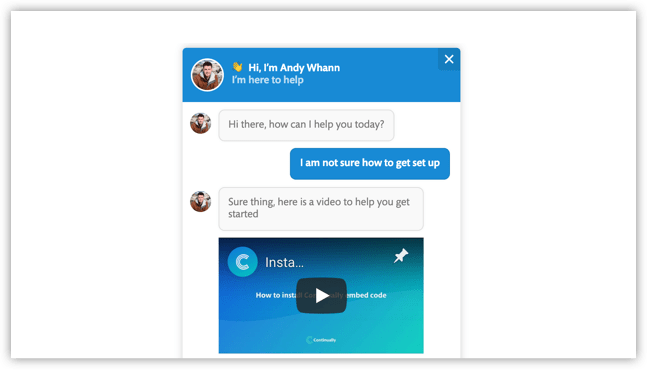 This would make the welcome message and bot flow super relevant to that potential customer. For example, you could match the ad headline and copy that brought them to your website. Or use the bot messages to offer a compelling call-to-action. 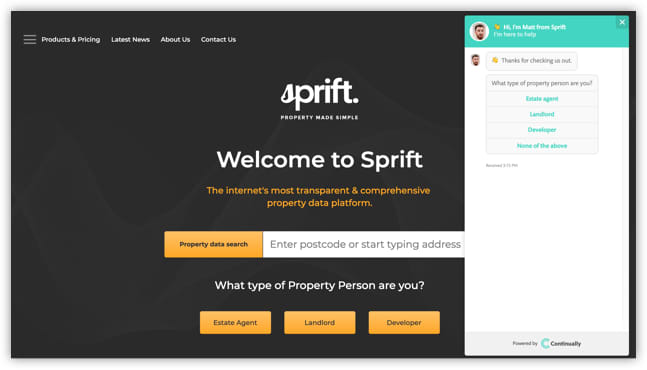 The team at Sprift serve a range of audiences with different needs. They tailor the bot flow to make sure that customers get the most relevant content. Automation is the future of marketing and customer relationships. It means that you can book meetings while you sleep. You can respond to people all over the world. You can be more efficient with your time. Those benefits are persuasive, so why isn’t everyone using bots? The biggest objection I’ve heard from companies considering automation is that they know there are some potential customers or scenarios that will work better with a real-life assistant. You can have the best of both worlds by helping customers to switch channel. Start with automation then move to the right medium for your audience. Automatic replies are great when you’re not there. 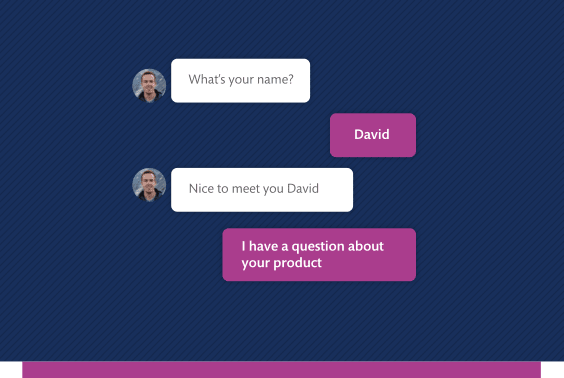 But when you are, you can always offer live chat for those times when you’re confident customers will get a reply quickly. By connecting your Continually account with your Slack workspace, you can make it easy for visitors to leave a message then reply from any device. You’ll can pick a Slack channel where you’ll get notifications about visitor activity, so you can quickly jump in and help out, in a place where your whole team can see what’s happened. This works really well for the 10-20% of questions that aren’t easily covered in a common flow. And it can help you uncover objections or customer anxieties that you weren’t aware of. Tip: Reply with live chat using Slack. Use bots to schedule meetings while you sleep. Allow visitors to book meetings on your website based on the free time in your calendar—all without lifting a finger. 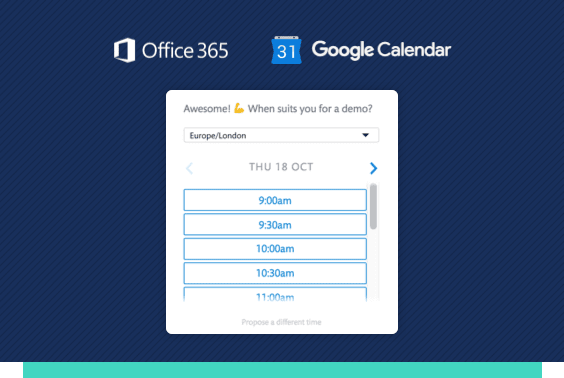 Just connect your calendar service, set your availability and you’re good to go. As a buyer, it can be frustrating when you’re ready to talk to a human and get hold of one. For the business, those are potentially your best leads. They’ve gotten far enough with their own research that they’re ready to engage in a sales conversation. We’ve talked before about how automation works best as a complement to human talent. Think of it as a way to give your team superpowers. Using bots is a great way to take time consuming tasks - like scheduling meetings - and do them more efficiently. As a buyer, it’s great to have the next step on your calendar so you know when you’ll hear back. What if the customer wants to meet but isn’t ready to buy yet? For the sales team, you can add some qualifying questions to the flow and make sure the customer is a good fit before committing to a meeting. And your sales team have a rich lead profile in hand for the meeting, so they are able to hit the ground running and use the call to move the sales opportunity forward. One of my favorite example is a customer we work with. If they detect that someone has a question and is ready to buy or needs help immediately, they often call them and they get a really good response rate on that because it’s targeted to people in that mood. They do it at the point whenever they have somebody is available to make that call and so they have people who are waiting for those messages. I think it as a great example of switching channels. Switching to phone is great, putting something on the calendar is good as well because it might not be urgent you might want to do it in the future, moving to E-mail is good too. So thinking about what’s the right channel of communication for the customer and getting them to that place is really helpful. The team at FieldMotion want to respond to customers in a channel they’re comfortable with. They ask for a phone number so they can confirm this is a good fit and get a demo organised quickly. We’ll automatically customers ask for their email address when they leave a message so you can follow up after. 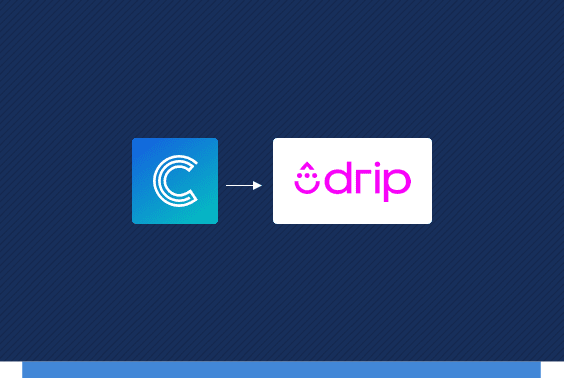 For customers going through an automated flow, you can ask for their email address and build the relationship over time. That person might be ready to be later or on or become an advocate for your brand. You can connect Continually to other tools in your marketing stack, like your email marketing platform. If you’ve used modern messaging apps or social platforms in the last few years, you’ll have seen how communication is much less formal. In places like Facebook, Twitter and Slack, emojis have become a simple, informal and universal way to express feelings and personality. According to the New York Post, over 90% of us regularly use emojis. Article: Emojis actually make our language way better. One of the challenges with a long stream of messages is the risk that it becomes flat and boring. Emojis allow you to use symbols to quickly signify ideas and emotions. Along with images, videos and gifs you can use emojis to make sure that things don’t get too serious 12. Emoji is a standardised set of characters that is available on iOS, Android, Windows and macOS. An important part of what makes emojis work well across those platforms is that they are sent as text, rather than images. This works using an international standard known as Unicode. Characters in Unicode are assigned a unique number that works no matter what the platform, program or language. This means that while the artwork for each emoji character varies by platform, the meaning of each symbol remains the same. There are currently 2,823 emojis in the Unicode Standard, so you should have plenty of choice 🤔. Striking the right tone of voice is so important to make a great first impression. Emojis are the perfect ingredient to add nuance and fill in the gaps in our messages. They help us to more concisely express emotion and to strike an authentic tone. Think of emojis as the digital equivalent of body language. They shape the way your visitors will interpret your messages. They work best as a complement to messages rather than as a substitute. Bots that are more engaging will drive better results for your business. Recent research suggests that emojis can make messages more memorable. When used in email, they lead to higher open rates. Struggling to find the right emoji? 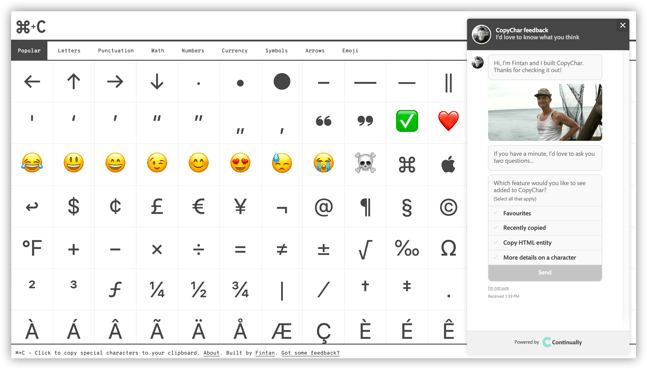 We’ve added an emoji keyboard inside Continually. If you need a little more choice then check out CopyChar. As always, a bot will work best when it helps serve your audience. So these are just suggestions you can try out. Our advice is to test out small steps and learn quickly, so you can see what works for your website.